We inkjet address post cards, self mailers and envelopes every day. Inkjet addressing is high quality, accurate and very fast. 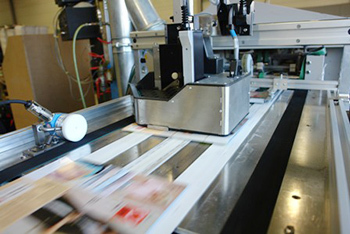 We can inkjet address over 13,000 pieces per hour, or up to 100,000 pieces of mail in a single day. We inkjet address everything from post cards to self mailers to envelopes of all shapes and sizes. We can inkjet address coated and uncoated stock in a wide variety of paper thicknesses. Since we inkjet address using the Intelligent Mail Barcode we qualify your mailing for the lowest postage rates available. Ask us to provide you with a free estimate on your direct mail project.